Yukon Gold! I had completely ignored my potato plantings this year up until today. The last time I checked on the Yukons I couldn't really find any. But then again I didn't dig all the way to the bottom of the containers. This afternoon I figured I should at the very least go dig through the French Fingerling bin before it got too cold out. I assumed that there weren't any in that container as well and had written the whole potato project off as an abject failure. Well, boy was I wrong. I dug up about seven pounds of fingerlings. Then I moved onto the Yukon Golds and dug up eight pounds of them. Hoo boy! Are we gonna have us some potatoes. Now, this doesn't seem like a whole lot of potatoes, but it is for us. Particularly since I haven't a clue how to store the little buggers. So, can any of you guys help me figure out how to store them? I have a room downstairs that stays fairly cold, but not cold enough and not humid enough. I don't have a root cellar. My other option is to keep them outside but I don't think it's humid enough either. It is my understanding that potatoes should be stored at a temperature of 40 to 45°F and a relative humidity of 90 percent. I could try to make space in the fridge. If I put them in the fridge I'm afraid the ethylene off-gassing from the apples will cause them to sprout. I just wished I had dug these up before Thanksgiving. Now that's local! So, please. Help me save my potatoes! We use to store the potatoes under the house in the crawl space. But that was many moons ago. Congrats on the harvest. I use the garage - an outside wall. But I hang them in pantyhose - put one in, tie a knot just above the potato, put another one in, tie a knot, etc. Then when you want them, slice a slit in the hose and you can re-use it for potatoes or onions later on. Depending on how fast you'll use them, we usually go through 5lb bags fast enough that I just leave them in our garage in the bag. Congrats on the potatoes! Harvesting potatoes is so fun!!! It is like a treasure hunt the whole time. Potatoes need dark more than they need coolth. A problem we discovered long ago (that any good grandma coulda told us) was that potatoes stored too cold get - sweet. Ick. I'd vote for black dark; 45-50°, and 80-90° humid. The more light they're exposed to, the more they tend to turn green- developing solanin, which is good bellyache material long before it gets seriously toxic, and makes the potatoes taste "off" long before any bellyaches. greenpa said it all - cool, dark place will do the trick! My parents used a very special technique for storing carrots that maybe you can try for your potatoes. They put the carrots in wooden bins full of sand - kind of like "planting them again" and kept the sand moist. The bins were in dark and cool cellar and when we needed a carrot, my sister or I would just pull one out. I'm sure the same technique would work on your potatoes, in my family we ate them much too quick! Good luck and do tell us how you stored them and how it worked out. Thanks! Most likely not a real method, but... when I was little, we lived next to a huge potato field. My dad would go out in the dark (I guess so they couldn't see him stealing?) and dig up a winter's worth. I wouldn't recommend the stealing route. Anyway, he put them in a barrel filled with sawdust, and left it out all winter, with a plywood cover on top. Ya, probably not a correct technique. I, too, have found that the dark is more important than it being humid. We hang ours in the basement in pantyhose much like anonymous suggested. Another route: if your family likes french fries, you can cut them up, give them a quick fry, and freeze them. Some of my earliest memories of my dad is him doing that with a giant stack of potatoes. Farmer John's Cookbook (of the film, The Real Dirt on Farmer John- yes, the guy who rode naked on his tractor with only an orange boa on and ate dirt from his hand) has an excellent appendix section, including "appendix C- vegetable storage guide." (The book is worth buying for that alone). Under potatoes, it advises keeping them unwashed, in a cool dark place, at an ideal temperatire of 40-50 degrees. There's a warning about the fridge- if the temperature gets too low (like into the 30's, the temp of most fridges) then the starch will turn to sugar- the problem mentioned above. 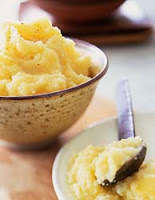 New potatoes should not be stored for long, he says, because their flavor will go off, and moisture is bad for any type of potato storage (for many reasons stated above). A final note from FJ: don't store potatoes too close to onions, as that will cause the potatoes to start to sprout. The first couple of years on our farm, we didn't have a root cellar, so I stored my spuds in a cool upstairs bedroom that doesn't get heated (it's probably in the 50s all winter). I just tossed a blanket over them, and they were fine until very late winter. I was so surprised, because I thought they were more persnickety than that!